Many people assume that good communicators possess an intrinsic talent for speaking and listening to others, a gift that can’t be learned or improved. 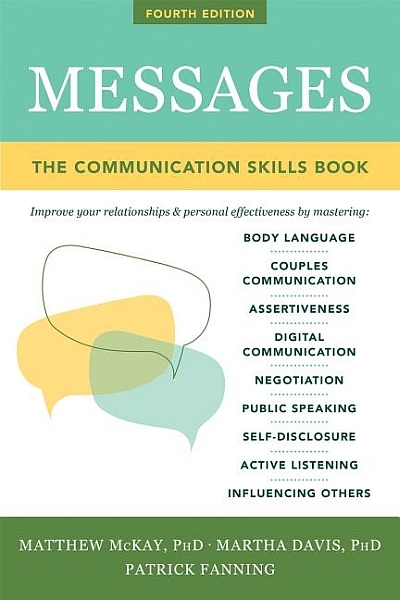 The reality is that communication skills are developed with deliberate effort and practice, and learning to understand others and communicate your ideas more clearly will improve every facet of your life. This new edition features a much-needed chapter on digital communication. Effective communication can easily be compromised when you’re not able to read your conversation partner’s body language, facial expression, or vocal tone. This chapter teaches you how to express yourself well via phone, email, texting, and video—all the skills you need to thrive in the digital age. Matthew McKay, PhD, is a professor at the Wright Institute in Berkeley, CA. He has authored and coauthored numerous books, including The Relaxation and Stress Reduction Workbook, Self-Esteem, Thoughts and Feelings, When Anger Hurts, and ACT on Life Not on Anger. McKay received his PhD in clinical psychology from the California School of Professional Psychology, and specializes in the cognitive behavioral treatment of anxiety and depression. Martha Davis, PhD, was a psychologist in the department of psychiatry at Kaiser Permanente Medical Center in Santa Clara, CA, where she practiced individual, couple, and group psychotherapy for more than thirty years prior to her retirement. She is coauthor of Thoughts and Feelings and The Relaxation and Stress Reduction Workbook.